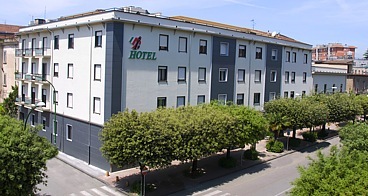 The Grand Hotel ITALIANO, the oldest hotel in Benevento, is located on a broad, tree-lined avenue just 100 mt. from the main train station and 600 mt. from the Cathedral. The elegant, functional halls equipped for meetings and receptions complete the services of the hotel. There is a free car park for the Guests. There is also an excellent value for money. Since 1923 it has been managed directly by the Italiano family with the collaboration of a team always available and attentive to the needs of the Guests. In a few minutes away on foot you can reach the historic center, where is the most historic and archaeological heritage of the city .